The most popular CRM pricing model is via a monthly subscription. Small business plans typically start from $12 to $20 per user/month, while enterprise plans are usually by quote. Generally, the more features and number of users you have the higher the pricing. Many vendors also offer a free but pared down version, while a few of them, especially HubSpot CRM, offer 100% free CRM that is as robust as any small business CRM. In today’s cut-throat business competition, securing a deep and lasting customer relationship is where the money is. This is among the reasons why CRM software is today’s biggest software market, whose set of powerful tools have been proven to effectively improve sales productivity for so many companies. However, with so many CRM vendors to choose from, companies are also faced with the challenge of determining the actual CRM cost for their business. The situation is not helped by the fact that most vendors use varied pricing models. So, how much does CRM software cost? This article will provide you with some key insights on how CRM tools are priced to help you make a sound decision in selecting the suitable platform for your business. Because calculating actual CRM costs is quite tricky, we’ve made an in-depth analysis of the payment policies of some of the leading CRM providers in the market today. You’ll discover the four major pricing models of most CRM software solutions, including the payment methods and a comparison of several pricing schemes. Over a decade ago, Harvard Business Review correlated the cost of CRMs with the benefits they provide and foresaw a bright future for them, at a time when these systems still required installations so expensive that only large enterprises could actually work out some profits using them. As businesses continue to increase their technology investment, one survey found that almost half of businesses are planning to expand their technology spending on CRM, not only due to competition but because their sales are indeed picking up because of its use. In general, CRMs are priced per user on a monthly basis. So basically, to calculate your monthly CRM expenses, you just multiply your CRM’s basic cost by the number of users in your company. On the average, CRM vendors offer a basic plan that includes the key functionalities of CRM, and a premium package that combines the basic features and the advanced functions like sales analytics and automation. As you’ll see in this article, CRM pricing is varied broadly, although the pricing schemes tend to fall in four main categories: free, single-payment, fixed-monthly, and quote-based. Still, the best way to know exactly how much you’ll spend is to talk directly with the vendor of your choice. To help you out in coming up with a list of suitable vendors, you can check out our 15 best CRM systems for your business. This way, you can make a better allocation of your resources, especially your budget. Most CRM vendors nowadays offer their products on a fixed monthly or annual price, usually with several plans available to cater to the needs of small, medium and large businesses. The exact amount depends on how many users or contacts you wish to involve, communication channels you’re looking to manage, and the type of deployment you’re interested in (cloud-hosted systems are usually cheaper at average prices varying between $50 and $100/user/month, while in-house CRMs will expect you to pay between $250 and $1000 per single user license). For some of them, you will also be able to purchase add-ons and functionality plugins or participate in dedicated Customer Success programs to help develop smarter customer relationship strategies. A recent trend is to build up plans with different sets of features, and let the user decide whether he wants basic functionality on a starter price or a fully-featured platform targeted as ‘Professional’ or ‘Advanced’. The best course of action with these products (or any CRM in general) is to check whether the vendor offers a free trial/demo, and compare packages on your own. Unless stated otherwise, trials and demos are free of charge, and usually, don’t require credit card data or any long term commitment. The most popular pricing basis, nevertheless, remains the size of the purchasing company, as developers are well aware that not every tool can be configured in detail to correspond to all companies. There are, of course, one-stop-shop CRMs with almost unlimited customization that you can tweak to the specifications of your brand, but they are usually offered on a single price that equals a small fortune for startups and growing businesses. The logic that applies, in any case, is to go as far as your budget allows: professional CRMs do make sense to developing businesses that can afford them. Another thing to remember here is to check the availability of customer support – in certain cases (reputed companies in particular) access to professional advice is reserved for premium users only. A good example that helps understand how fixed pricing works are the plans of one of the most popular CRMs out there: Pipedrive. At the moment, the system is offered in three different versions (Silver, Gold, Platinum), each priced according to the market tier targeted with it. You can sign up for a Pipedrive free trial here. The Silver Plan, equipped with all necessary sales management features, live chat and email support and team organization is available for $12.50/user/month (ideal for small businesses and startups). The Gold Plan adds more features to the package with automation for optimizing sales processes. It is priced at $24.20/user/month (ideal for medium businesses). The most expensive Platinum plan targeting enterprises that work at scale costs $49.17/user/month. This gives users revenue forecast reports, SAML SSO, and more advanced security and automation features. Zoho CRM – Starter Plan costs $12/month and Professional is priced at $20/user/month for additional social CRM, macros, and unlimited records. Nutshell – Starter Plan is available for $19/user/month and Pro Plan is $35/user/month with additional sales process automation, advanced reporting and cross-sell and upsell automation. Pipedrive, one of the popular CRM tools, offers tiered pricing based on feature set. Quite often, you will come across ‘by-quote priced CRMs’, and unless you have experience negotiating software deals, you may dismiss the idea of purchasing a potentially solid product just because of it being ‘overly complicated’ to acquire. However, quote-pricing is among experts’ most preferred and recommended payment solutions, predominantly because it shows that the company offering it is flexible and ready to compromise. Basically, if you ask them how much does CRM software cost in their case, they are more likely to offer an answer you will like. Quote-priced CRMs are suitable for all businesses but don’t discuss specific prices and payment details. Instead, the vendor invites interested users to contact his sales professionals, share the details of their company (in particular their expectations of this software), and then tailors a unique price for the functionality they can afford. For instance, a startup service provider may purchase a single-channel CRM, instead of paying for a rich omnichannel platform that also reports, generates leads, and covers collaboration capability for large and decentralized teams. Put into perspective, this means you should approach your CRM choice with an exact list of wishes and preferences. Certain providers develop detailed growth plans for midmarket businesses and gradually increase the number of features in order not to burden their budget’s capacity too much. In cases like these, it is of vital importance to give systems a test drive first with a free trial, so that you will know exactly what to ask for. In order to understand how custom pricing works, look at Yotpo, where customers are asked to contact the vendor’s sales personnel to get a personalized quote for their business. The easiest way to do that is to submit a request on the vendor’s website, entering the basic information about your company. The same approach was adopted by tools such as Siebel CRM and WakeUpSales. Yotpo offers two options: a free plan and a premium plan for small to enterprise businesses. This option is usually reserved for in-house and on-premise CRM suites that target large enterprises with plenty of homegrown software solutions. With an excess feature suite and an open API architecture, these solutions won’t exactly cater to the needs of small and modest businesses, as they involve expensive installations and hardware purchase, and usually, put users through long training to obtain the coding knowledge necessary to associate them with other systems. In terms of payment, these solutions are usually covered with a user license you only need to purchase one time. Prices for these licenses vary from $1000 upwards, depending on the reputation of the provider and the functionality of the system. In certain cases, the license has to be renewed each year/established period and consequently costs less ($200-$800 a year, on average). InfoFlo is one of the several popular single-payment CRMs. Its users are expected to cover a license priced fee at around $99 for the InfoFlo Basic plan for its core products. Depending on the features you need, you can opt for add-ons at additional prices ranging from $79 to $99. Other CRM solutions with similar plans are ManageEngine SupportCenter Plus which is available in 3 editions and GoldMine Premium (offers pricing that can be amortized in over 3 years). You can sign up for an InfoFlo free trial here. HubSpot CRM is completely free forever. There are also open-source CRM platforms that are offered free-of-charge, but in most cases, their functionality is basic and demands that the user would switch to a paid plan once his operations expand in size or complexity. The user gets to choose between popular CRMs that also offer paid plans you can upgrade to as your needs grow (Insightly or Bitrix24, for instance) or a CRM that is entirely free such as HubSpot. These systems require no credit card details or long-term commitments, but we do recommend that you read some expert evaluation for each of them to see if they match your business’s needs. In case you’re running a small business or are still not sure what to expect, opting for a free CRM is definitely a good option. For developed businesses with considerable client lists, however, it may be better to look for a professional and affordable system. The best example of a powerful and completely free CRM is HubSpot CRM, where all features and support are available at no cost. Some other CRM vendors offer free-of-charge packages in addition to their standard paid plans. These include Freshsales (Sprout Plan for managing and basic scoring of leads and contacts, and unlimited phone and email support is available for free) and Insightly (a no-frills plan for 2 users to get started in managing contacts, sales, and projects). Monthly payment is typical for cloud-hosted systems with fixed pricing schemes, but may also apply for quote-priced ones (check details with the vendor). What it means is that the user is expected to cover a monthly fee in order to use the product, with or without an annual subscription contract that would prevent him from shifting to another package or system. The reason why most customers consider annual subscriptions as an alternative to month-to-month payment is that they significantly reduce the price (10-25% on average). Alongside annual subscriptions, certain CRM providers offer per-annum licenses which users cover for at the beginning of the year, and are not expected to meet any monthly fees until that year is over. These licenses usually cost between $200 and $1,000 and are more common among locally hosted systems than cloud-based ones (here, the rationale is that a user should pay only for as long as the service meets his needs and quality criteria). The drawback with annual payment is of course that you pay for the whole year in advance and if for any reason you decide to resign from using a given CRM you will lose money. If you already decided to stick with a particular vendor though, an annual plan will usually let you save some money in the long term. As we’ve discussed previously, in house CRMs are usually offered against a lifelong license, which also carries the responsibility for a user to update and maintain the system on his own. For large teams and international enterprises operating with sensitive data, this is definitely a more affordable option compared to month-by-month payments for premium and advanced suites. The prices of these licenses come down to several thousands of dollars, depending on the size of the company or the functionality it is about to acquire. Most CRM providers support credit card and wire transfer payments, while some of them also accept checks and direct bank transfers. Make sure you’ve checked all additional fees and charges required by the service provider, and choose the option that is most secure and affordable. HubSpot CRM is a common winner in the ‘which software to buy’ debate, as it is offered absolutely for free, but yet goes beyond the expected ‘basic CRM kit’. The application of this system is also not limited to retail businesses, but rather fits all users in need of customer intelligence. If your intention is to get an intelligence collecting system that doesn’t exclusively cater to sales management needs, you can save the bucks you’d invest in Pipedrive or any other paid CRM system. What will you get for free? HubSpot doesn’t offer the same sales management functionality of Pipedrive, but you can still rely on basic pipeline tracking, phone, and email integrations, or connect it with other leading CRM and marketing systems. Despite being free, HubSpot CRM has some of the world’s best data enrichment functionalities, including a powerful and fast leads backlog users can easily master in no time. Another reason to consider HubSpot CRM is that it organizes and tracks your contacts automatically. In fact, you get to manage as many as 1,000,000 contacts and users, and more importantly – your storage capacity is not limited at all. Similarly to paid systems, HubSpot CRM integrates with leading social media and ensures you will have the chance to target larger audiences. Unfortunately, HubSpot CRM still doesn’t offer an advanced reporting kit to analyze the data it collects (it relies on third-party integrations instead). The list of integrations with other software providers is large, but there is no open API for the user to count on custom integrations. On top of that, HubSpot CRM offers phone support for all users, regardless of whether they’ve just started to use the tool or are longtime clients. You can also use it on all devices and types of business venues, but unlike Pipedrive, it doesn’t support multiple languages and currencies. If you want to start your adventure with this robust CRM, you can easily sign up for a HubSpot CRM free app here. Software development history will reveal a number of top-notch vendors that ‘burned’ in their own desire to go beyond their capacity, but that’s not the Salesforce case. If you are already using some of their products, or have at least heard of their beneficial effects, you’ll see no other reason but to also use a genuinely powerful CRM tool they provide. The question, however, remains the same: is the system worth of what you’d pay for it? Just like Pipedrive, Salesforce CRM charges on a per-user, per-month basis on an annual subscription. The main difference between the two is that Salesforce CRM limits the number of users you can include in each of the plans. Storage and access to support channels, nevertheless, remains the same for each plan. There are four plans available. The most basic starting plan Salesforce offers is Salesforce Essentials available for $25/user/month, where you can include only 5 users, and obtain a fairly basic accounts & contacts management suite. This plan is packed with out-of-the-box CRM features you need to get started in managing leads, customers, and sales. For more functionality, you should look at the Lightning Professional plan ($75/user/month) which is a complete CRM solution for any size of your team. It offers more functionality in configuration, collaboration and cross-selling and upselling. An even better, but significantly more expensive platform is the Lightning Enterprise plan $150/user/month), where functionality is extended with the Sales Console app, accurate sales forecasting, and real-time sales insights. This is also the plan where you obtain a credible Salesforce identity, private AppExchange, and access to web service API that help connect the tool with third-party software other than email service providers. The most expensive plan available is the Lightning Unlimited plan ($300/user/month), packed with enterprise-grade contact management features, Sales & Service Cloud Consoles, sandboxes, and unlimited custom app development. Basically, Salesforce CRM offers a really well-tailored plan for companies coming from each market tier (startup, small, medium, and large businesses). Note that Salesforce CRM also offers Cloud Lightning and Service Cloud Lightning upon request, and for an additional fee. If you want to try its features for free you can easily sign up for a Salesforce CRM free trial here. 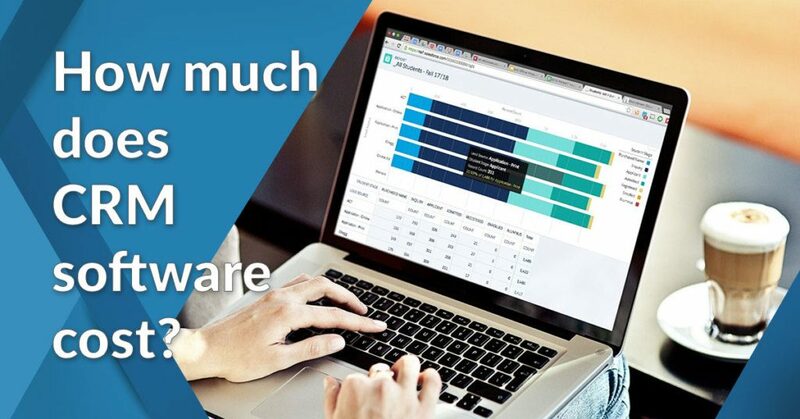 Pipedrive is certainly one of the ‘look no further’ CRM systems for companies that can afford it, and that’s justified with a robust feature suite and spotless functionality. What forms the package-to-package gap in Pipedrive’s case is storage and email import, as the number of users is unlimited in all packages. In fact, Pipedrive plans are all priced per user, so the decision whether to assign a single user or 50 of them is completely up to you. The lowest plan available is the Silver Plan, where businesses are charged $15/user/month ($12.50/user/month for an annual subscription). Higher plans cost $29/user/month ($24.20/user/month billed annually) for the Gold Plan, and $59/user/month ($49.17/user/month billed annually) for the Platinum Plan. In all three cases, users get a full sales management package (multiple pipelines, personal revenue goals, customizable pipelines, fields, and activities), chat and email support, and mobile apps. The Gold plan offers more advanced automated workflows such as a full conversation history and the ability to send and view emails without leaving the platform. On top of this, the Platinum plan adds a dedicated private environment for your sales data and live phone support. The vendor also offers a free trial plan if you want to try out the software at no cost first. You can easily sign up for Pipedrive free trial here. Since it’s already established that a CRM is something that every business today must have, the next pressing step is selecting the most suitable CRM platform for your business. But with so many CRM tools to choose from, the challenge now is on how to rummage through the wide array of choices. To successfully do so, you must have a selection checklist on hand to help you select the CRM tool that directly aligns with your immediate and long-term goals. What is the best way to connect the requirements and priorities of your business to the CRM tools under consideration? After you’ve made your own research, how can you effectively use the results of your market inquiry in choosing the most suitable CRM for your business? Should you set a particular timeframe to select a CRM or use a flexible approach, enabling the selection process to evolve and then finalize its objectives free from any deadline? Who among your employees should be tasked to lead the selection activities? How can you identify the specific CRM features would best serve your business objectives? These considerations are not exhaustive but are enough to get you started in the right path toward selecting the right CRM for your business. Finally, in case you still haven’t made any selection yet, why not start with one of the best CRMs. You can sign up for a HubSpot CRM free app here.